Climbing to the summit of Mount Kilimanjaro, the highest freestanding mountain in the world is a challenge of a lifetime! The Shira (13,140 ft or 4,005 m). The Mawenzi (16,893 ft or 5,149 m). The Kibo (19,431 ft or 5,895 m). The Kibo volcanic cone encompasses the Uhuru peak, the ultimate destination for climbers. Mt Kilimanjaro is quite a popular destination for hikers. Each year, there are between 15,000 to 20,000 hikers that attempt the climb of the Kilimanjaro. The overall success rate is about 65%, which at first glance seems to be quite low. Thus, to further improve your odds of reaching Africa’s roof, preparation is paramount! Of course, getting physically and psychologically fit is crucial, but bear in mind that the selection of the climbing route also weighs heavily on your success rate. I sifted through the different climbing routes on Mount Kilimanjaro and featured in this Kilimanjaro routes review the best routes for climbing the Kilimanjaro. The Machame route is a 9-day trip. 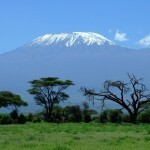 Climb Mount Kilimanjaro from the south. Travel through five ecosystems: rainforests, moorlands, alpine desert, Stone scree and ice-capped summit. Your adventure begins at Moshi. Five campsites: Machame Camp, Shira 2 Camp, Barranco Camp, Karanga Camp, and the Barafu Camp. Descend by the Mweka route. As you travel to the Shira 2 Camp, you will hike through a spectacular rainforest, which is the home to the black and white colobus monkeys and some exotic birds. Don’t forget to bring your binoculars and camera to fully capture the wildlife! Then, your next stop will be the Great Barranco Valley with its breathtaking Breach Wall. Enjoy the gorgeous landscape while you further continue to acclimate yourself to the high altitude. Offer great opportunities for acclimatization, since you hike high and sleep low. The steepest route of the Kilimanjaro. A high volume of traffic (2nd most popular). The level of difficulty: High. Only for the most experienced and fit climbers. This trail is best suited for the experienced hikers since the climb is quite steep! So if you are looking for a challenge to test your limits, then the Machame Route is the path for you to the summit! The Rongai route has gained the reputation as being a real wilderness experience, particularly at the beginning of the climb. The Rongai route is an 8-day trip. The only trail that allows you to climb the Kilimanjaro from the north side of the mountain. The Rongai route crosses through the Saddle between the Kibo peak and the Mawenzi peak. Your journey starts at the Rongai Gate. 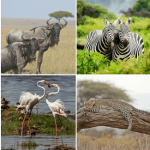 Four campsites: the Simba Camp, Kikelelwa Camp, Mawenzi Tarn Camp, and the Kibo Huts Camp. Descend via the Marangu route. On your way to the Simba Camp, you will travel through a pine forest where you might come face to face with white Colobus monkeys. So, keep your eyes peeled and camera handy to capture your memorable encounters! Ideal for people with little backpacking experience. Very low volume of traffic. See both sides of the Kilimanjaro since you descend via the Marangu route (south). The level of difficulty: Medium. Route of choice during the rainy seasons (April to May and from November to mid-December). The least scenic route of the Mount Kilimanjaro. A lengthy travel time to get to the starting point. No suitable opportunities for acclimatization. The principle of hike high and sleep low cannot be applied to this route. I listed as one of the Pros that the Rongai route is the preferred route during the wet seasons. But why? The answer is, its location! The Rongai route is on the north side of the mountain. It receives much less rainfall than the other routes during the rainy seasons. Thus, the trail is less muddy, slippery, and hence, less hazardous. I highly recommend the Rongai route, especially if you have no backpacking experience or very little of it. It’s the easiest route on the Kilimanjaro! Furthermore, if you are planning to hike on the Kilimanjaro during one of the rainy seasons, then for a more enjoyable adventure to Africa’s roof, the Rongai route is the trail of choice. The Lemosho route is one of the newest trails for climbing to the Uhuru Peak. As you travel toward the Mti Mkubwa Camp through the rainforest, you will come across a diverse flora as well as an abundant birdlife. Thus, the Lemosho route is the ideal trail to hike to Africa’s roof for all the nature lovers and bird lovers as well. So, don’t forget to pack your binoculars! 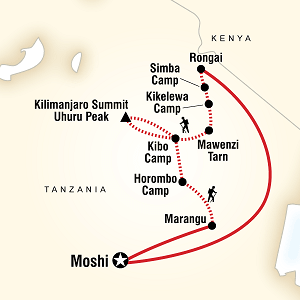 The Lemosho route is a 10-day trip. Climb the Kilimanjaro from the west side of the mountain. Six ecosystems along the way ranging from rainforest to alpine desert. Your adventure begins at the Londorossi Gate. 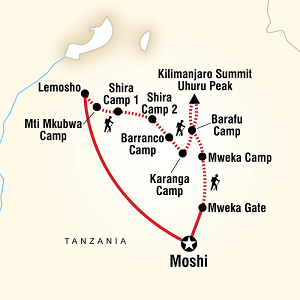 The Lemosho Route merges with the Machame route at day 4 of the excursion. Six campsites: the Mti Mkubwa Camp, Shira 1 and Shira 2 Camps, Barranco Camp, Karanga Camp and the Barafu Camp. Descend via the Mweka route. Low volume of traffic, yes, but… only for the first 3-4 days. Afterward, you will encounter more traffic since the path merges with the Machame Route. Scenic route with spectacular views of the gorges on the west side. Extra days included in the package for acclimatization. Not the best option during the rainy seasons. Even though the Lemosho route has an impressive success rate, I strongly urge you NOT TO USE this route during the rainy seasons. The reason for this is simple. The first section of the trail crosses through the rainforest which receives a tremendous amount of rain, making the route quite slippery and hazardous. 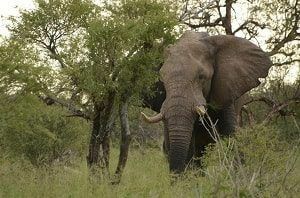 So, steer clear of the Lemosho route during the months of April to May and also from November to mid-December! • Your own room/tent. If you travel solo, you can get a single room or own tent for an affordable price (under $500). • A Massage at the Lala Salam Spa (in Moshi). Mount Kilimanjaro is quite an undertaking, to say the least. So, why not pamper your sore muscles with a 30 or 60-minute massage after the climb! Not only your muscles will thank you but also the Tanzania’s women cooperative which is the project funded through this initiative. So, when selecting a package for climbing the Kilimanjaro, you ought to consider the length of the trip, the level of difficulty of the route as well as the cost. Furthermore, it is well worth it to take a couple of extra days for a better acclimatization to increase your odds of reaching the summit. 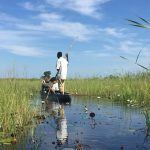 Yes, it might be more expensive to book an excursion of 9-10 days, but don’t forget this is a once in a lifetime adventure where failure is not an option! If you are climbing the Kilimanjaro for a charity, you should put achieving success first. You need to choose a route that has a high success rate and allows ample time for acclimatization. Thus, it’s a no-brainer, you should opt for the Lemosho Route a 10-day trip, by clicking here. If climbing the Kilimanjaro is on your bucket list, then the Rongai Route is your ticket to reaching the summit! 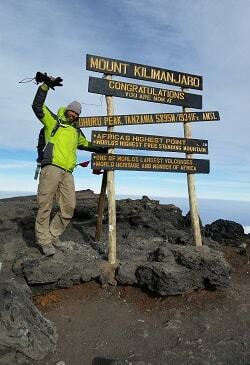 The Rongai trail with its impressive success rate is considered one of the easiest routes of the Mount Kilimanjaro. So, are you ready to embark on your adventure of a lifetime? Click here to book your excursion today! If you have any questions about my Kilimanjaro routes review or would like to add your personal review, please leave a comment below. I am looking forward from hearing from you. Good Stuff!! Very nice information for me because I have a company in Tanzania for the people who love mountain climbing. I want to suggest one more route i.e. the Umbwe Route which is also a good route. Thanks for input. I am glad that you found value in my post. I must be honest, I have no desire to climb any mountains literally.. instead, figuratively climbing them is enough for me. I’m afraid of heights! However, this site is Superb! If I were into mountains, I would definitely come here for recommendations! It’s very informative. I’ve never heard of this location before, but you have made it come alive with the video you have here. I love the pros and cons. You make it easy to make a wise decision for travel and finding new adventures. Very informative post, I live in South Africa, and because of that, if I ever decide one day to climb a mountain, Kilimanjaro would be at the top of my list. I did not realize there were three different routes to choose from. I really like the way you have broken them down and pointed out there pros and cons. Great article, good read. There are in fact seven climbing routes available to reach the summit of the Kilimanjaro, the Uhuru Peak. I only review the three best ones in my opinion. If you are interested in learning more facts about Mount Kilimanjaro, such as the others climbing routes available, read my post here. Wow, Mount Kilimanjaro is for sure a beautiful mountain. That would be quite an adventure, thanks for your review. 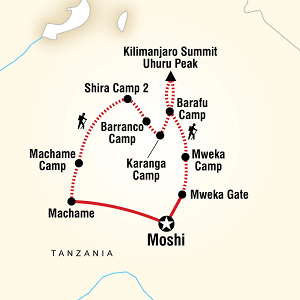 The Lemosho route is the trail I would pick to reach the summit. The scenery along that trail is breathtaking. I will definitely put on my bucket list the Kilimanjaro. Hopefully, I will be able to travel to Africa one day. I will bookmark your review, for future references. 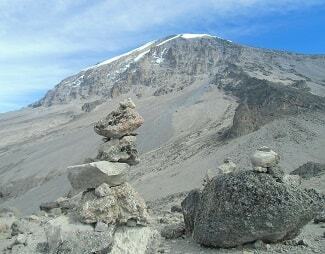 The Lemosho Route is a great pick for climbing the Kilimanjaro. Don’t forget to bring your binoculars to observe the spectacular views while hiking to the summit! Just wanted to add that I’ve done two trips with G Adventures, the company you recommend, and I’d also VERY HIGHLY recommend them. They are reputable, organized… I did the Inca Trail trek with them, and they certainly did their best to make it a great experience for me. No doubt hiking the Kili with them would be similar. To anyone reading the comments here, G Adventures is a GREAT travel company! I hope that you add climbing the Kilimanjaro on your bucket list! Maybe you can bring your kids along when they are older! Thank you for sharing your views about G Adventures, as you said G Adventures rocks!